The Sunday Times reports that Boris has met Sir Howard Davies, to push his opposition to Heathrow expansion (and probably his idea of a massive Thames Estuary airport). This would be built in the sea, just off the coast of Whitstable and Herne bay, and have five runways – with the potential for a sixth. This airport could handle 150m-160m passengers a year – more than double the current size of Heathrow. They claim this airport could be built in 7 – 8 years, and it “would be able to handle 3 flights landing and 3 taking off simultaneously, growing to 4 each way if it is expanded to 6 runways. This would enable it to accommodate about 240 flights an hour.” (Has NATS been consulted??) The airport terminal would be at Ebbsfleet near Gravesend with tunnels for high speed rail links under the Thames (or perhaps overground) to the airport. The plans by Bridget Rosewell’s would cost an estimated £49bn, falling to £39.5bn if the railway goes partially overland. Appears to be just south of the 175+ wind turbine London Array. Map of the area. The Ebbsfleet station is just to the west of Gravesend, to the far left of the map. The airport would be off Whitstable and Herne Bay. A NEW airport with at least five runways could be built on an island in the Thames estuary in almost the same time it would take to build a third runway at Heathrow, according to proposals to be submitted to Sir Howard Davies’s aviation review. The site off the Kent coast could handle 150m-160m passengers a year, more than double the current capacity of Heathrow. It would also have the potential to add a sixth runway. The plan, seen by The Sunday Times, is based on the original “Boris Island” proposal drawn up by Douglas Oakervee, the engineer who oversaw planning and construction of Chek Lap Kok airport in Hong Kong. It is now set to be the main rival to a plan by Lord Foster for a giant onshore airport on the Kent side of the estuary. Boris Johnson, the London mayor, is a supporter of a new Thames estuary airport as Britain’s main international aviation hub. He has met Davies to detail his opposition to expanding Heathrow and has attacked as “utter inertia” the government’s decision to give Davies until 2015 to produce his final report. The new plan has been drawn up by Bridget Rosewell, former economic adviser to the Greater London Authority under Johnson and Ken Livingstone, his predecessor. Under Rosewell’s plan, the main terminal for the airport would be at Ebbsfleet, on the Kent coast just east of the M25, from where passengers would travel in a high-speed train through a tunnel to the airport. Construction would take between seven and eight years, enabling the airport to open in 2025. A Heathrow third runway is likely to take only a year less to construct. Although expansion at Heathrow has backing from airlines and business lobbyists, supporters of a new airport warn that soon after a third runway, a fourth would be needed. This could involve having to place runways across the M25 and moving reservoirs. The Thames airport would be able to handle three flights landing and three taking off simultaneously, growing to four each way if it is expanded to six runways. This would enable it to accommodate about 240 flights an hour [ie. 3 takes offs and 3 landings every 90 seconds for one hour]. Siting the terminal at Ebbsfleet, which has a station along the HS1 (High Speed 1) link to the Channel tunnel, would lessen the need for new infrastructure. It is likely that an extension of the new Crossrail line across London would be needed. The former Eurostar terminal at Waterloo in London could be revived to provide rail capacity and another lane would be required on the eastern half of the M25 for the extra traffic. Johnson’s spokesman said: “The mayor has always said he’d look favourably at a range of options to the east of London, and this plan is no exception. Yet another ambitious proposal for a multi-billion pound airport terminal off the north Kent coast has emerged – this time linking a Thames Estuary airport with the international rail terminal at Ebbsfleet. Dubbed the London Jubilee International Airport (LJIA), it has been put forward by a former advisor to London Mayor Boris Johnson. Bridget Rosewell, former economic advisor to the Greater London Authority, says the designs would cost £49bn and be open for business by 2025. The airport would be equipped to handle up to 160m passengers a year. A key difference to other designs already in the public domain is that it would look to utilise the rail hub at Ebbsfleet to form part of the terminal complex, before a high-speed rail service took passengers to the runways, built off the coast of Sheppey, Whitstable and Herne Bay. It would boast five runways – with scope to extend to six. However, the plans have already been slammed by a leading borough and county councillor who described them as “unworkable and unaffordable”. But Ms Rosewell said she believes the idea will eliminate noise issues for residents and said the plans were not unaffordable. Ms Rosewell added that wildlife would not be affected as there are already wind farms on the site. She said: “If the turbines can be there then we can put the airport there. It’s not where there are lots of birds. However, a spokesman for CPRE Protect Kent said the airport was not needed. Kent County Council, Medway Council and surrounding borough and district councils are all opposed to the idea of a Thames Estuary airport. DONG Energy, E.ON and Masdar today (29/10/2012) announced that the first power had been produced at the London Array Offshore Wind Farm. London Array is being built around 20km off the coasts of Kent and Essex. The wind farm will be installed on a 245km2 site and will be built in two phases. Phase One will cover 90km2 and include 175 turbines with a combined capacity of 630MW. The consortium plans to complete the first phase by the end of 2012. If approved, the second phase will add enough capacity to bring the total to 870MW. 1. Cliffe. 2. Foster scheme. 3. Maplin (Foulness). 4. Off the Isle of Sheppey. 5. Shivering Sands (“Boris Island”). Mr Huppert said: “This report shows the ship’s slow deterioration is continuing with the lethal cargo still on board. 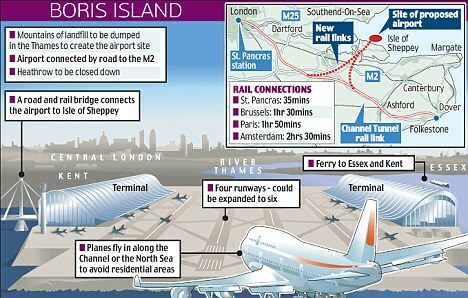 This must surely put an end to the bonkers idea of building an airport in the Thames Estuary. “Just last month the Royal Navy had to destroy a wartime mine found in the Thames Estuary because of the ‘significant risk to public safety’. “If this cargo ship was disrupted by construction the explosion would be 2,000 times larger, it would blow out every window in Sheerness, and create a 16ft wave just outside the capital. 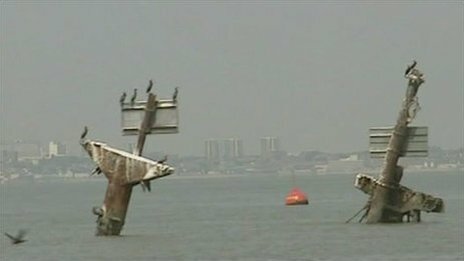 The Maritime and Coastguard Agency (MCA) said the results of a 2010 survey showed the wreck of the SS Richard Montgomery, which lies 1.2 miles (2km) off the coast, remained in a “similar condition to that found in 2009”. A spokesperson for the Mayor of London said: “The mayor believes the Thames Estuary to the east of the capital is the most logical location to build the type of four runway hub airport our economy so desperately requires. Following a structural survey in 2009, the MCA found that although the hull appeared to be “reasonably stable” a crack in one of the vessel’s holds was “of concern”. The section contains 2,000 cases of cluster bombs, nearly 600 500lb bombs and more than 1,000 1,000lb bombs. The Department for Transport said the survey showed the wreck was stable. A spokesman added: “In the summer we will consult on an overarching sustainable framework for UK aviation and alongside this we will publish a call for evidence on maintaining effective UK hub airport connectivity. Previously experts have said if the wreck exploded it would cause a metre-high tidal wave. The vessel lies in 50ft (15m) of water off the mouth of the River Medway, with its masts visible above the surface.